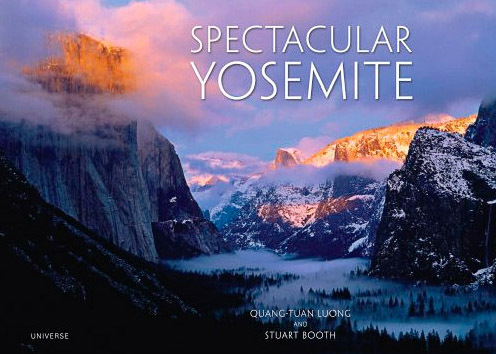 At least a true coffee-table book on Yosemite, full of scenic images reproduced very large. Famous Yosemite Valley is depicted in all seasons, from viewpoints low and high, classic and unfamiliar. The book then moves to the high country and follows its two main rivers, the Merced and the Tuolumne. More in blog post about the book. Located in California's Sierra Nevada mountain range, Yosemite National Park encompasses 1,170 square miles of awe-inspiring natural splendor. It is best known for its waterfalls and the 3,000-foot vertical rock face of El Capitan, but within its borders grand meadows, ancient giant sequoias, and vast wilderness also exist. Spectacular Yosemite captures this incredibly unique park in more than 150 photographs, celebrating one of America's most renowned natural treasures. This unique, oversize volume offers a guided tour through its stunning photography.